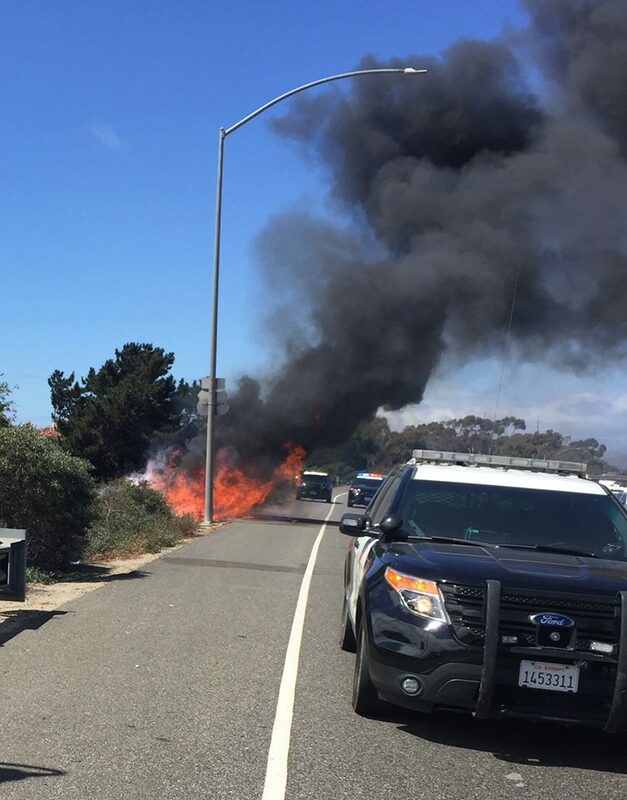 An approximately 100-mile police chase that spanned large portions of Ventura and Santa Barbara counties ended in a fiery crash in Oxnard Tuesday. A man driving a stolen vehicle with paper license plates led officers from the city of Ventura to Goleta and back down the coast to Oxnard before driving off Highway 101 and sparking a brush fire. At 11:47 a.m., a Ventura police officer noticed a suspicious vehicle with no visible license plates in the area of Mills Road and Main Street. As the officer attempted to investigate the vehicle, the driver sped away through a residential area, according to a Ventura Police Department news release. The driver ran a stop sign and accelerated at a high speed, and a police pursuit began. The suspect then entered the westbound 126 freeway and merged onto northbound Highway 101. His speeds reached in excess of 90 mph. When the driver crossed into Santa Barbara County, the California Highway Patrol took over the chase. KCOY reports the driver turned around in the Winchester Canyon area of Goleta. While driving southbound on Highway 101, the suspect blow out one of his tires, possibly from various spike strips laid down by CHP officers. The driver reportedly ran over another spike strip near Ventura. He was driving on his front rims and was struggling to maintain control of the vehicle for the remainder of the pursuit. As the driver passed the Vineyard off-ramp, he lost control and drove off the side of the highway, according to the Ventura Police Department. The crash ignited a brush fire on the side of the highway, which engulfed the suspect’s vehicle. 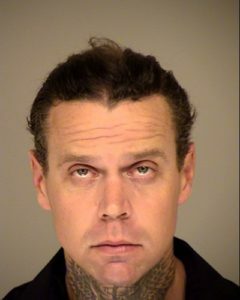 The suspect, whom police identified as Ventura resident Jason Fenstermacher, 35, evaded the flames but was arrested. Fenstermacher was taken to the hospital where he received treatment for minor injuries. Officers then booked Fenstermacher into the Ventura County Jail on charges of felony evading and driving a stolen vehicle. Police determined the vehicle had been reported stolen out of Santa Barbara County a week ago. A life doomed by an unlucky moniker. Fate sealed by the neck tat. Neck tattoos and a vacant stare, I rest my case. How much do you want to bet that he is on parole or probation? This is the type of guy that the Ninth Circuit Court has turned loose on us because we weren’t being nice enough to the convicts in our prisons. I’m sure his mother is very proud of him. OK, just in case anyone might be curious, fenstermacher in German means “window maker.” Fenster (window), macher (maker, or builder). That is our German lesson for the day. Guten tag, und auf wiedersehen. Clearly a misnomer. That cat ought to be making license plates. Well, then, in that case, his last name would be Nummernschildmacher. Nummernschild (license plate), macher (maker, or builder). This guy needs an agent to exploit his movie career. He’s a natural for that look.